Greetings Loyal Airmen, we’re thrilled to kick off this week’s Flight Log with the release of our latest Airship 27 Productions’ title. JEZEBEL JOHNSTON – Mourning Star…is the fourth in the Jezebel Johnston Pirate Queen created and written by the amazing Nancy Hansen. It follows the rise of a young Caribbean island girl who matures among various pirate crews and quickly finds herself addicted to the life of a freebooter. 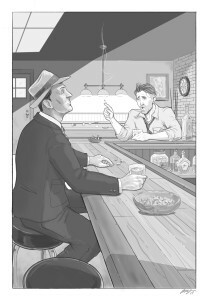 Canadian artist Ted Hammond provided the gorgeous cover and our own Rob Davis the 9 black and white interior illustrations you’ll find within the book. This fourth chapter actually ends the first part of Jezebel’s saga and we do plan on putting out a big book later in the year collecting them. Stay tuned. Meanwhile, as ever, you can pick up JEZEBEL JOHNSTON – Mourning Star at Amazon in both paperback and on Kindle…and eventually as an audio book. In other news, the Air Chief finished his second class in “How to Write Comics & Graphic Novels,” at the nearby Front Range Community College last evening. The past ten weeks working with these three talented writers was a pure joy. Left to right you have Scott Ladzinski, Max Williams, the Air Chief and Olivia DeGaine. The work they produced in this class was simply amazing and we have no doubt all three will go on in the comics game to have stellar career. As for the Air Chief, we’ve found so much pleasure in teaching we’ve no intention of stopping now. We will take the summer off, what with planned trips back East to visit friends and family, but if all goes well, we’ll look to starting up the next class some time in Sept. We’ll keep you posted. Finally we though we’d give you Loyal Airmen a sneak peek at a project currently in the works at Airship 27 Productions. 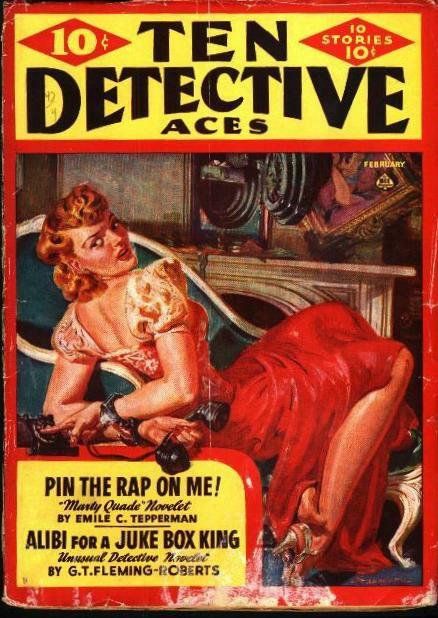 Always wanting to do more mystery/crime type books, a few years ago we asked Chicago based writer Christ Bell to find us an authentic pulp private eye who we might resurrect with new stories. 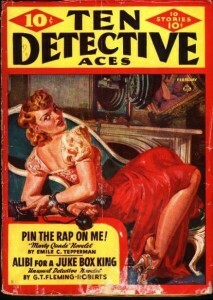 Taking to his task like a kid to ice cream, Chris soon unearthed a series of stories written for Ten Detective Aces, one of the finest mystery pulps of its time, featuring a gumshoe named Marty Quade; created and written by veteran pulpster Emile C. Tepperman. Chris then proceeded to write up a short “bible” of the character and we solicited our stable of Airship 27 writers to see who wanted to pen a new Marty Quade tale. 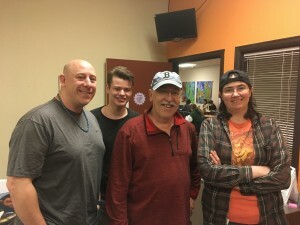 Chris naturally did one and was joined by fellow scribes Gordon Dymowski, Gene Moyers & Michael Black. 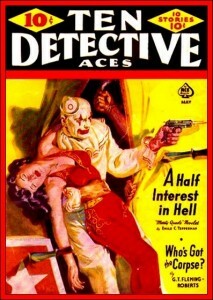 Then we were truly lucky in recruiting new artist Brian Loner (see illo above) to sign on to the project. Brian has approximately 5 more illustrations to wrap up, and then we’ll go into final production on a spanking new title – MARTY QUADE – PRIVATE EYE. This is why the Air Chief loves his jobs. And that’s a wrap, Loyal Airmen. As ever, thanks for stopping by and we’ll see you back here next Friday.